Her height was medium and her countenance, indescribably beautiful. She was dressed in a robe the color of the dawn, high-necked, with plain sleeves. Her head was covered with a white veil, which floated over Her shoulders down to her feet. Her feet rested upon a globe, or rather one half of a globe, for that was all that could be seen. Her hands which were on a level with her waist, held in an easy manner another globe, a figure of the world. Her eyes were raised to Heaven, and her countenance beamed with light as She offered the globe to Our Lord. Mary told her that the globe represented the whole world, especially France, a country whose faithful had recently suffered horrible persecutions in the Revolution's Terrors and was still going through "Enlightenment" perfidy. The vision changed to Mary, still standing on a globe, rays of light streaming from her fingers, enframed in an oval frame inscribed with the words, "O Mary, conceived without sin, pray for us who have recourse to thee." The whole vision "turned" showing the back of the oval inscribed with the letter "M" entwined with a Cross, and the hearts of Jesus and Mary, the former surrounded with thorns, the latter pierced with a sword. 12 stars circled this oval frame, symbolizing the 12 Tribes of Israel and the 12 Apostles, and showing Mary as the Mother of Israel, per the Apocalypse (ch. 12). Mary told her to strike a medal in this form, and that all who wore it after having it blessed would receive graces. Another miraculous conversion involved that of a wealthy Jewish banker-lawyer named Alphonse Ratisbonne. He was actually dared to wear one of the medals and to pray the Memorare. This he did, and as he visited a church to arrange a funeral for a friend, he had a vision of Our Lady as she appears on the Medal. He instantly converted, and became a priest. 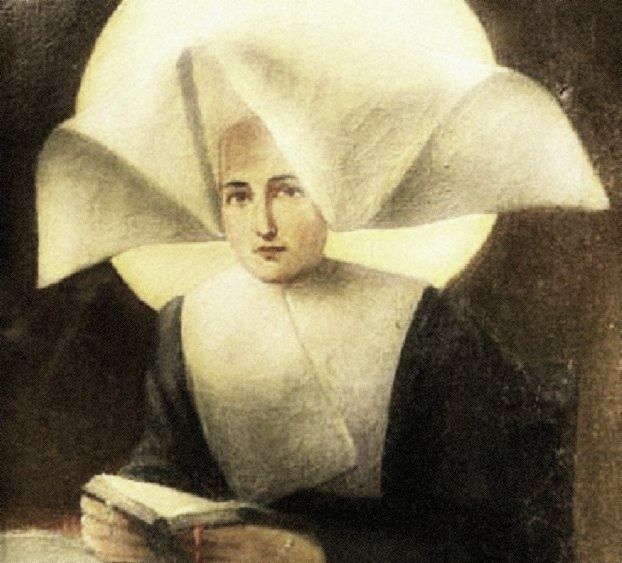 St. Catherine Labouré's body remains incorrupt to this day and can be seen at her convent at Rue du Bac. Read also about devotion to the Immaculate Heart.